In the Gospel we read about how Jesus overturned the tables of the merchants and the moneychangers in the Temple at Jerusalem. Worship was big business, little to do with one’s interior relationship and the offering of one’s heart to God. Rather than offering God interior sacrifice, the Jews offered animals which the merchants sold to worshipers. Also, moneychangers exchanged Roman coins, which bore the image of the Roman emperor, for the temple coins that were needed to pay the temple tax. The Temple that should have been a house of prayer had been turned into a market place. Jesus' action at the Temple in Jerusalem is recorded in all four Gospels and is often understood to be among the events that led to Jesus' arrest and Crucifixion. The Gospel of John, however, places this event much earlier in Jesus' public ministry than do the Synoptic Gospels. In John's Gospel this event occurs at the very beginning of Jesus' ministry, after his first miracle at the wedding feast at Cana. The clear message in the Gospel is that Jesus is the true Temple of God which cannot be destroyed, and their way of worship was false. John uses this story to interpret the destruction of the Temple of Jerusalem which happened in 70 A.D. John is explaining to his audience, an early Christian community, that it’s okay to abandon these Jewish practices. Temple worship had been surpassed. Worshipping God was no longer about satisfying the old law of Temple sacrifice as Jesus himself became the sacrifice pleasing to God. His Body, the Church was the new Temple. To worship was to draw close to Jesus interiorly through faith, and by communing with Jesus we enter the mystery of his offering his life to the Father. 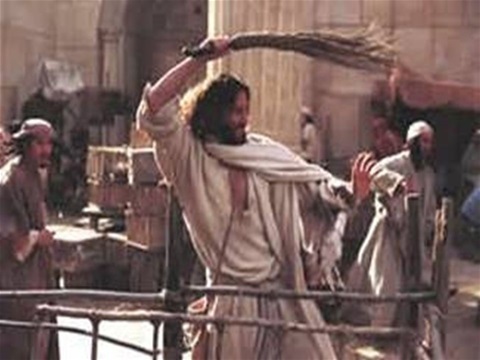 In the story, after the cleansing of the Temple, John's Gospel tells us that the people asked for a sign of Jesus' authority to do such an audacious act. Remember he was preparing Israel to worship in a way truly pleasing to God and the sign was to be his Resurrection. Because Jesus rose and sent his Spirit, we are the Temples of the living God and we worship God by perpetuating the mystery of Jesus’ passion, death, and Resurrection. The Eucharist does this and is now the sign the Lord’s Resurrection which we share in as we participate in the Lord’s sacrifice. During Lent we reflect upon the rich mystery of God’s Love and how to respond. We take this opportunity to consider the quality of our prayer and worship, particularly the quality of our inner sacrifice. It is good to follow external rules such as God’s commandments. But we must also gather to worship God by experiencing anew, and within us, the passion, death, and Resurrection of Jesus. This sacrifice of Jesus is the mystery we are celebrating right now.